Much of the article is about large scale megastructures, most of which is interesting but not really news to OA readers and contributors. But one section contains some very useful data and equations about the largest possible rocky or icy worlds. As most worldbuilders know, if you increase the size of a gas giant it will eventually reach a maximum size, a little larger than Jupiter, and after that limit the planet will just get denser due to compression. (There is also an adjsutment for temperature, but adding extra mass will not affect the diameter so long as the temperature is comparable). As you can see, the largest rocky worlds would be around 3 times Earth's radius, with 300 x Earth's mass. Any heavier than this, and the planetary material becomes increasingly denser, and indeed appears to contract. In reality such a planet would be surrounded by a large hydrogen/helium atmosphere, as neither of those gases could escape - it would probably have a lot of water too, although Jupiter seems to have less water than expected, so this isn't a given. Waterworlds would have a maximum radius of 4.5 Earths, with a similar mass, while the unlikely case of an iron-only planet would have a maximum radius of 2.3 Earths, at a slightly lower mass of about 250 Earths. The figures in the paper apparently are sightly larger, with iron's maximum diameter at a mass of 274 Earths, perovskite (rock) at 378 Earths, and for ice at 359 Earths. It would be interesting to imagine a maximal Earth with a mass 30 times our own world's, and certain clades could probably tolerate the 3+ gee conditions on such a world; but to get to this state the hydrogen/helium atmosphere would need to be removed somehow. Perhaps this could be a project for a slightly eccentric transap obsessed with terraforming, or it might be a relic of some ancient vanished civilisation. But I doubt it could form naturally. An ice world in a suitable orbit could be a massive ocean world with hundreds of km deep seas. They could be teeming with aquatic sophonts, though they'd probably want to bring a few asteroids into orbit to provide building materials. I miscalculated the gravity, incidentally; that's because I initially thought the diagram showed 37 Earth masses, not 378. A 378 Earth mass planet would have a gravity of 39 gees, not quite so hospitable. Now I come to think of it it seems impossible that such a large rocky planet could ever form naturally. Some very dense planets are known, such as HD 149026b and 55 Cancri e; but none of them have a solid core anywhere near this large. Alrighty. I want to try something with this. I've been drafting a large, high-G planet Phlegethon for the stalled Lethe EG article anyway. Very large planets - a few hundred Earth masses - are a wee bit challenging to create. However, rocky cores of gas giants may reach into the 10's of Earth masses, especially with a little handwaving and invoking the words, "high metallicity system." Further, it'd be nice to make this a habitable - or fairly human-accessible - planet. I don't see a problem genetweaking folks to 3-5Gs with OA's genetech. So, that's another reason to cut out planets with 39Gs and hundreds of Earth masses. If I used the chart correctly, a 30 Me peksov...perksv...peros...rocky planet will have a radius of 2.8x Earth. That gives a 3.8G surface gravity. Not bad, and almost 8x Earth's surface area. It's not a question of "Can you remove enough atmosphere that way?" But rather, "Can Phlegethon survive?" Phlegethon is 30 times Earth's mass but at 8 times the surface area takes 3.75 times as long to cool. Well, it isn't too much to ask for Phlegethon to be 9 or 10 billion years old, is it? It probably took a while for the twin neutron stars to spiral down, too, so there's another need for the system to be old. 9 billion years would leave Phlegethon shedding heat like Earth at 2.4 billion years of age. Hot, but not magma ocean hot. This is sort of a lost cause without getting into paraterraforming. Phlegethon isn't orbiting a cheery, lifegiving star. It orbits a neutron star. It probably has traces of a hydrogen-helium atmosphere; anything else that seeps out of the crust will freeze. So, did I get that right? 30 Earth masses, 3.8G, 2.8 Earth radii? Is that a reasonable way of shedding the atmosphere? 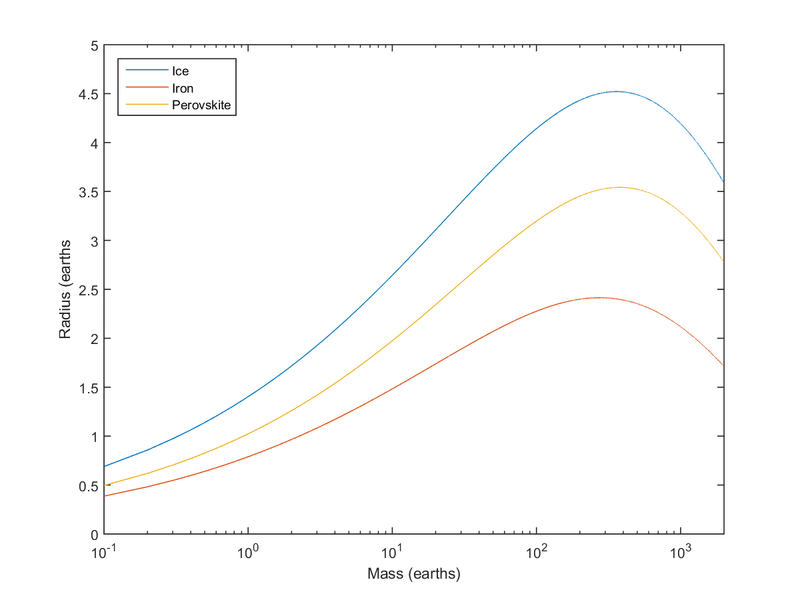 Anders' graph is useful for estimating the size of planets at any size, not just megabig, of course. (06-25-2015, 06:58 AM)stevebowers Wrote: Anders' graph is useful for estimating the size of planets at any size, not just megabig, of course. And my last post basically ended up duplicating his "Double Earth" article. If the planet has lost its primary atmosphere, it could gain a new one by outgassing and from the materail deposited on it by the dead star. Note that Earth probably had a primary atmosphere at some point, probably long before the impact that formed the Moon. This consisted largely of H/He, but was rapidly lost by Jeans escape and sputtering (any last remnants, including primordial neon, were lost in the Moon-forming event, I think). Early in the history of an Earthlike planet, one or more large impacts, especially by bodies larger than Mars, could have rid it of its lighter elements, especially hydrogen and helium? Then any fragments would eventually reassemble to form a planet (with or without a large moon)? Varieties of carbonyls could predominate. Since they have different freezing and boiling points, there would be plenty of variable, foggy weather.